Gullah Culture in America begins with the journeys of 15 Gullah speakers who went to Sierra Leone and other parts of West Africa in 1989, 1998, and 2005 to trace their origins and history. Their stories frame this fascinating look at the extraordinary history of the Gullah culture. The existence of the Gullahs went almost unnoticed until the 1860s, when missionaries from Philadelphia made their way to St. Helena Island, South Carolina, to establish the Penn School to help freed slaves learn to read and write. There, they discovered hidden pockets of a bygone African culture with its own language, traditions, medicine, weaving, and art. Today, more than 300,000 Gullah people live in the remote areas of the sea islands of St. Helena, Edisto, Coosay, Ossabaw, Sapelo, Daufuski, and Cumberland, their way of life endangered by overdevelopment in an increasingly popular tourist destination. Having evolved from the original Penn School, the Penn Center, based on St. Helena Island, works to preserve and document the Gullah and Geechee cultures. Author Wilbur Cross originally set out to make the excellent work of the Penn Center known and to introduce the Gullah culture to people in America. He became entranced with the Gullah way of life and ended up with 12 chapters that explore the various facets of Gullah culture. 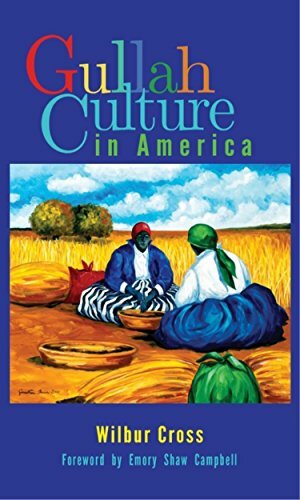 Gullah Culture in America not only explores the history of Gullah but also shows readers what it’s like to grow up and live in this unique American community. After receiving his degree from Yale University, Wilbur Cross served in the United States Navy and started a career as a copywriter in New York. He spent 10 years as an editor at Life magazine and contributed many articles to Time and Life. He is the author or coauthor of more than 50 books on a wide range of subjects, including history, biography, culture, travel, and health. Cross is a member of the Authors Guild and the Time/Life Alumni Society. He lives on Hilton Head Island, South Carolina. Born and raised on Hilton Head Island, Emory Shaw Campbell is executive director emeritus of the Penn Center and a renowned community leader among the Gullah people. In 2002, he founded Gullah Heritage Trail Tours in an effort to educate tourists about the Gullah language and culture and promote indigenous crafts and artists. He is the author of Gullah Cultural Legacies and served as a consultant and editor for Gullah Culture in America. If you have any questions about this product by Brand: John F. Blair, Publisher, contact us by completing and submitting the form below. If you are looking for a specif part number, please include it with your message.